An Air India Express passenger plane crashed in flames after overshooting the runway in the southern city of Mangalore on Saturday, killing most of the 166 people on board. 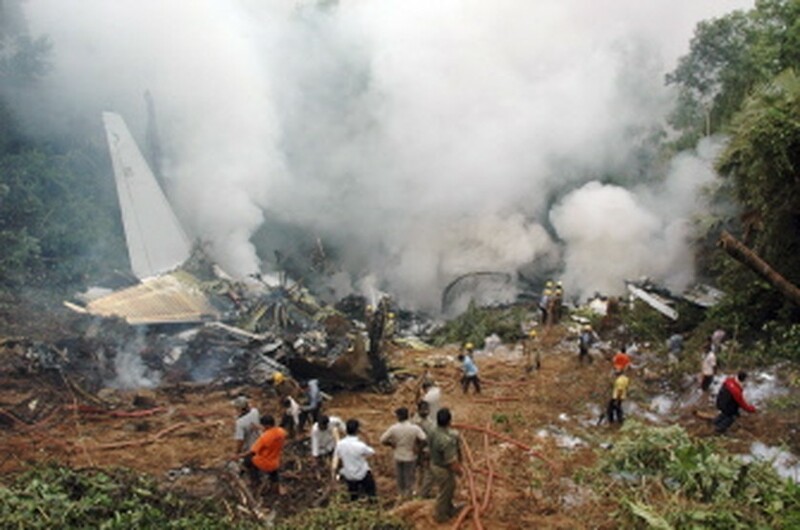 Rescue personnel are seen among the smouldering wreckage of an Air India Boeing 737-800 aircraft which crashed upon landing in Mangalore on May 22, 2010. (AFP Photo). The state-run carrier said at least eight people had been rescued from the burning wreckage of the Boeing 737-800 which was carrying 160 passengers and six crew on a flight from Dubai. Eyewitnesses said the aircraft had touched down before careering off the end of the runway into a shallow gorge and bursting into flames at around 6:30 am (0100 GMT). "As far as the information available with us is concerned, eight persons were rescued and shifted to local hospitals in Mangalore for treatment," Anup Shrivasta, Air India personnel director, told a news briefing in Mumbai. Television footage showed at least three survivors being stretchered into a nearby hospital. One survivor, Umer Farooq, told the NDTV news channel from his hospital bed that he had heard a loud thud as the plane touched down. "Then the plane veered off toward some trees on the side and then the cabin filled with smoke. I got caught in some cables but managed to scramble out," said Farooq who had burns to his arms, legs, and face. It was the first major plane crash in India since 2000, when 61 people were killed after a passenger plane crashed into a residential area near the eastern city of Patna. Karnataka Home Minister V.S. Acharya called for local people's cooperation in what he called "this hour of crisis" and urged them to stay away from the crash site. "It is feared that most of the people have died," Acharya told reporters. V.P. Agrawal, chairman of the Airport Authority of India told reporters in New Delhi that there had been no distress call to suggest a technical fault. "The visibility was six kilometres (four miles) when the aircraft approached the runway which was more than sufficient," Agrawal said. Air India Express is a subsidiary budget airline operated by the state-run carrier. Television images showed the plane had partially broken up, with smoke billowing from the main fuselage, as rescue workers sought to douse the fire with foam. Rescue teams had to struggle down steep, wooded slopes to reach the plane, and were shown carrying body parts away from the site. The airport is located some 20 kilometres outside the coastal city of Mangalore, which is around 320 kilometres west of the Karnataka state capital, Bangalore. Civil Aviation Minister Praful Patel was due to fly to the site from New Delhi later Saturday. Many Indians from Karnataka and other southern states work in Gulf cities such as Dubai as construction workers, domestic staff and in other low-paid jobs. They send much of their earnings back to India as remittances, and return to India for their annual leave. In a statement, US-based aircraft manufacturer Boeing said it was sending a team of investigators to India to help in the crash inquiry. 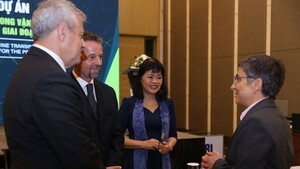 "Boeing wishes to express its profound condolences to the friends and family of those lost... as well as its wish for the recovery of those injured," it said on its website. India's worst aviation accident occurred in 1996 when two passenger planes collided in mid-air near New Delhi with the loss of all 349 on board both flights. The crash was blamed on a Kazakhstan Airlines plane descending below its assigned altitude, putting it in the path of a Saudi Arabian Airlines plane that had taken off minutes earlier from the Indian capital's airport.